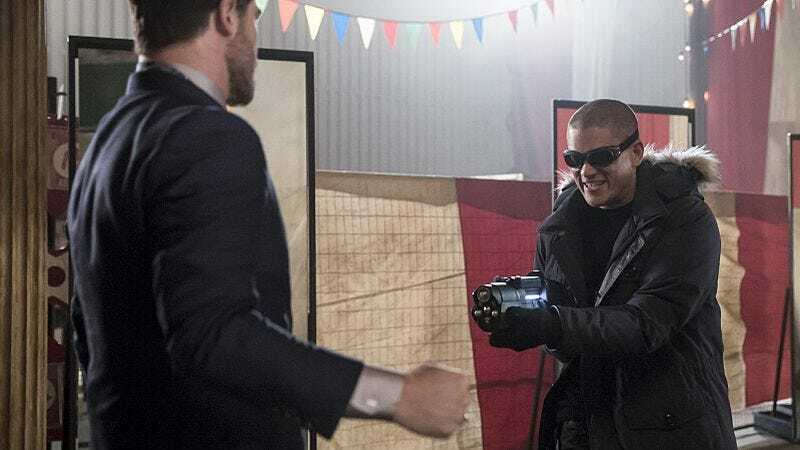 “The New Rogues” is a treat for those of us who fell in love with The Flash during its first season and spent much of the second worrying the show might never pull itself out of its funk. It’s the most giddily entertaining hour of the series in ages: light on its feet and overflowing with humor, adventure, and Silver Age goofiness. The glum tone of the Zoom era, which persisted into the first couple of third season episodes, has now been left in the dust. Whether it can last remains to be seen, but for now I’m grateful for this return to form, which begins appropriately enough with a flashback to when it all began: the night of the particle accelerator explosion. In his pre-Cold days, Leonard Snart had a disagreement with one of his henchmen, Sam Scudder. Before Snart can finish the argument in permanent fashion, the dark matter wave hits and sends Scudder into a mirror, where he remains trapped for three years. When the building is scheduled for demolition and a cleanup crew arrives, Scudder escapes and rescues his former partner Rosalind Dillon (now a vertigo-inducing meta dubbed Top by Cisco) from Iron Heights. I’ll admit to be a little disappointed in the CW version of Mirror Master, a character I’ve been waiting for since the show’s debut. Grey Damon (Aquarius) plays Scudder as a run-of-the-mill thug who doesn’t get much of a charge out of his newfound abilities, and his shiny suit is a snooze compared to the classic orange-and-green get-up of the comics. (Maybe he’ll work his way up to that if he returns.) The episode could have done a little more with mirrors as devices of illusion rather than simply portals for quick escapes. There’s some fun to be had once Barry gets trapped inside a mirror, with Cisco making an inevitable Twin Peaks reference once he recognizes that Barry is speaking backward, and Caitlin secretly unleashing her Killer Frost powers in order to break Barry loose. The real joy this week comes from the interplay of the characters, who are more relaxed and funny than they’ve been in ages. It’s a great relief that the writers decided one hour of Mopey Cisco was more than enough, as he’s now back to his wisecracking, pop culture referencing self. He and Harry are the standout comedy duo, with Tom Cavanagh delivering some of his best line readings to date. (My favorite was “How dare you, sir! That is not a riddle.” At least for five seconds, until he followed it up with “I care for you, too, you jackwagon.”) Their quest to pluck a replacement Wells out of the multiverse is some straight-up vintage DC Comics nonsense, and I loved every minute of it. I’m sure Cavanagh felt the same way as he cycled through Redneck Wells, Fop Wells, Mime Wells, and finally Hipster-Doofus Wells. My guess is that “H.R.” is a temporary replacement, and that Harry and Jesse will be making a more permanent home of Earth-1 in the near future, but the ever-expanding gallery of Wellses continues to entertain. The rest of the cast is in fine form as well. 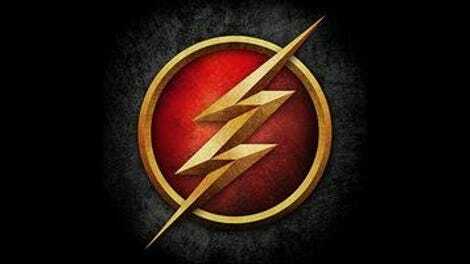 Jesse is the spark Barry needs to reconnect with the pure enjoyment of being a speedster. (He even has a self-aware moment after their training session: “Oh my God. I think I’m Oliver.”) She brings out the best in Wally as well, helping him come to terms with his lack of speed force by zipping him around the city. (I guess we’ve completely dispensed with the notion of civilian clothing catching on fire, unless the entire team has been equipped with speed-proof duds.) Even the Iris/Barry courtship is mostly played for laughs as Barry and Joe both struggle to overcome their discomfort with the situation while Iris remains blissfully unaware (or unconcerned) about the relationship’s incestuous overtones. In the end, Barry’s method of trapping Mirror Master probably could have used a bit more clarity (I guess he surrounded Scudder with enough mirrors that he couldn’t escape all the reflections? ), but it’s always good to see Wentworth Miller again, even in hologram form. Miller’s dry, witty performance has embodied the right tone for The Flash since the beginning, and for this week at least, the show nailed it. Scudder’s hideout, the abandoned Broome Industries building, is an homage to one of Mirror Master’s co-creators, John Broome. He and Carmine Infantino introduced the character in the March 1959 issue of The Flash. The episode also features a nod to the second incarnation of Mirror Master, created by Grant Morrison for his Animal Man run in the late ‘80s. When Wells beats Cisco to naming the villain, he mentions that Earth-2 already has a Mirror Master: Evan McCulloch. I wouldn’t mind at all if he showed up sometime soon. Joe’s got a girlfriend. Well, almost. Maybe. Caitlin sure is looking Frosty at the end.